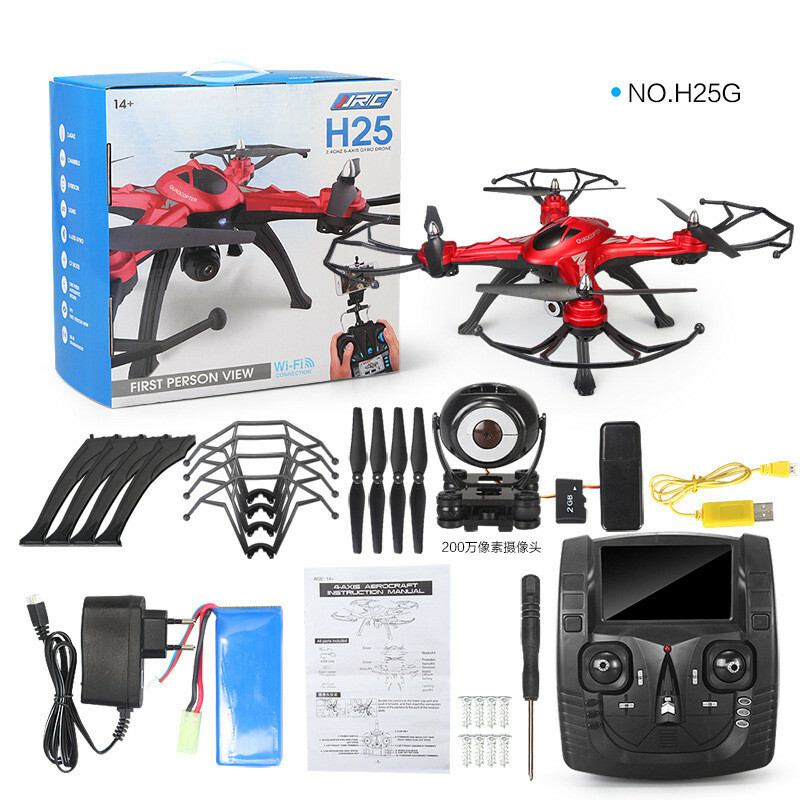 The H25 arrived in a big retail box, almost similar in size of Syma X8 and X8G packaging. 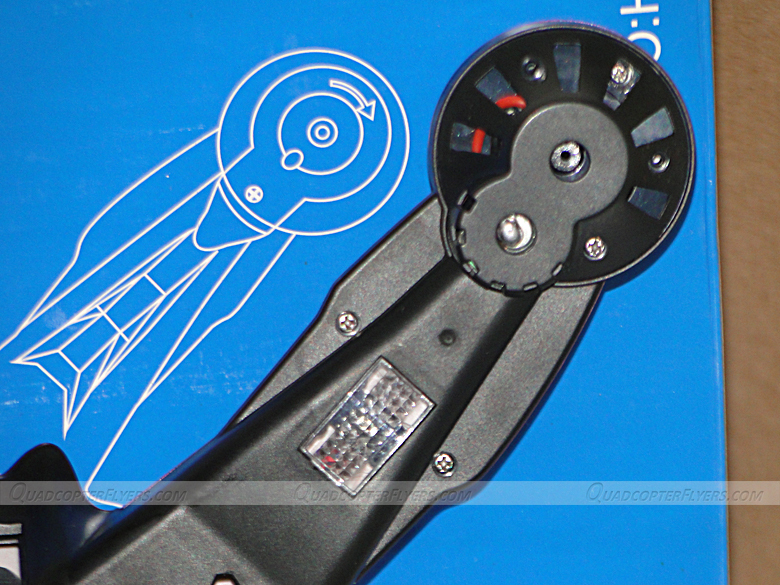 For your reference, here are the quick dimensions (19.68 x 19.68 x 7.09)" / (50 x 50 x 18)cm (L x W x H) of the package. 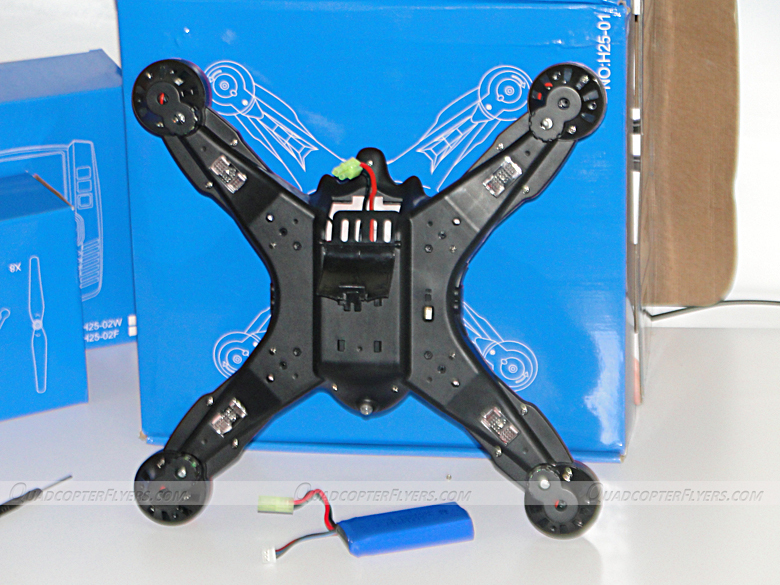 The supporting components like the transmitter, the Landing skids, the propellers and its spare parts are all shipped in individual sub-boxes, seems neatly packed. 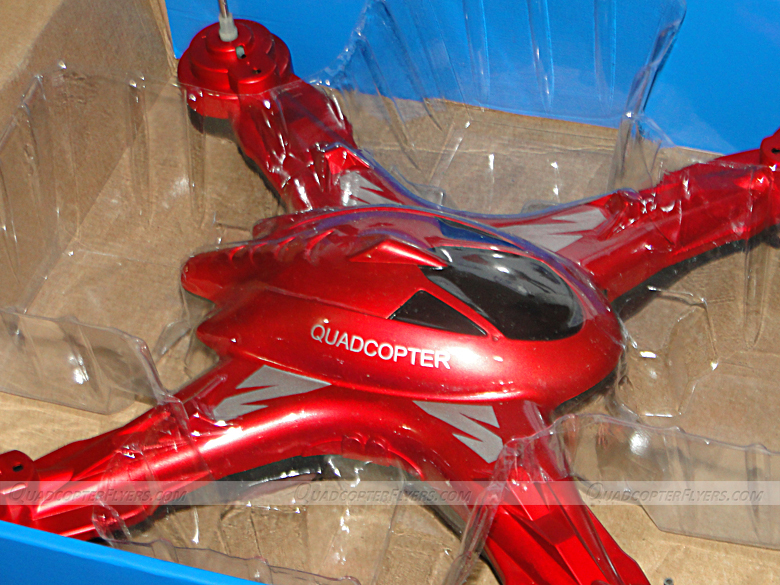 In my view the shipment can sustain rough handling when crossing borders. 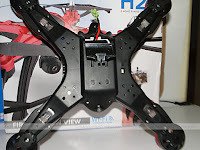 What you see out of the box, is the bare JJRC H25 with nothing installed, you got to spend some time screwing the skids, propellers and the guards. 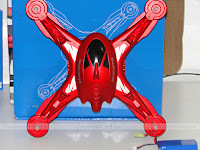 thanks to the clearly laid instructions in the manual and on the retail box with schematic diagrams, the assembly of the quadcopter consumed at-least 45 minutes of time! 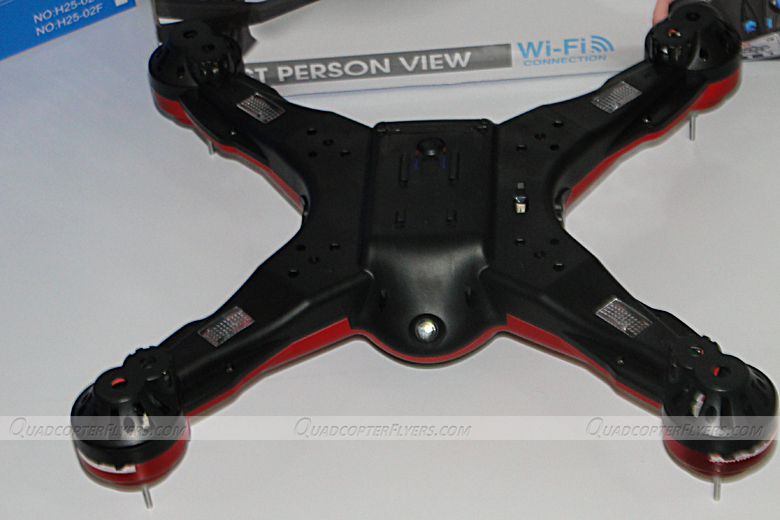 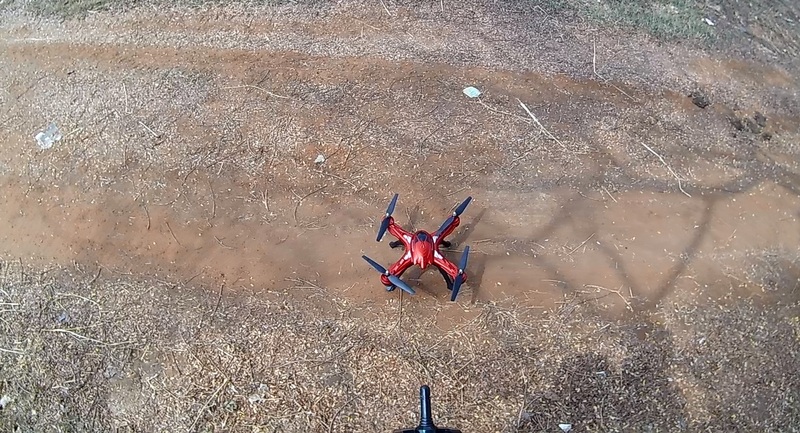 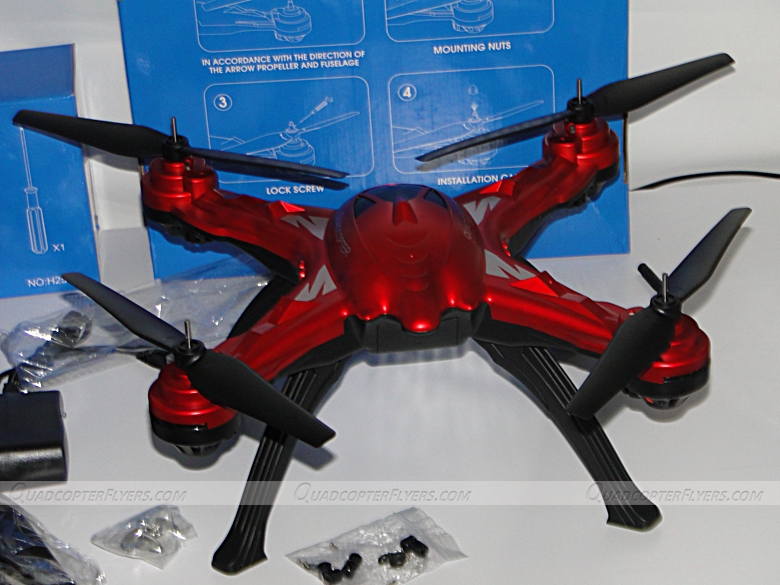 The first thing that draws the attention of the JJRC H25 Quadcopter is its design and size, though it looks similar to the JJRC H9D, in design, the size is bigger and comparatively equal to Syma X8 Quads. 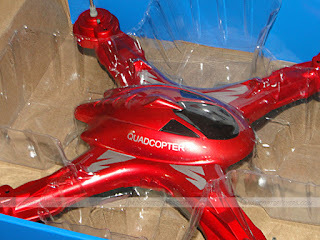 At the top, the design is a single piece molded hard plastic and it's really hard that it can sustain all the crashes. 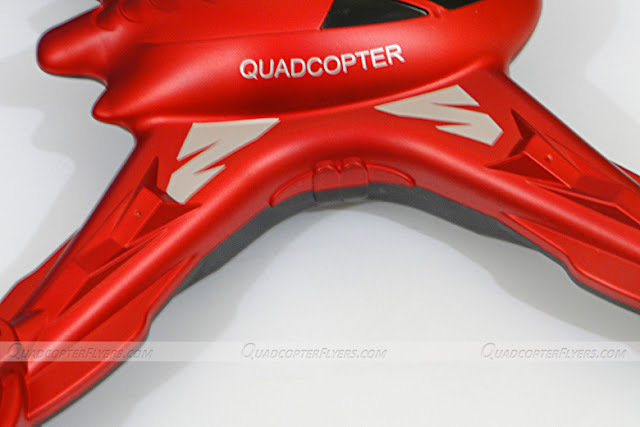 With no JJRC Branding nor the product number anywhere on the quad, you will just find a name "Quadcopter"
At the back, the design is simple. 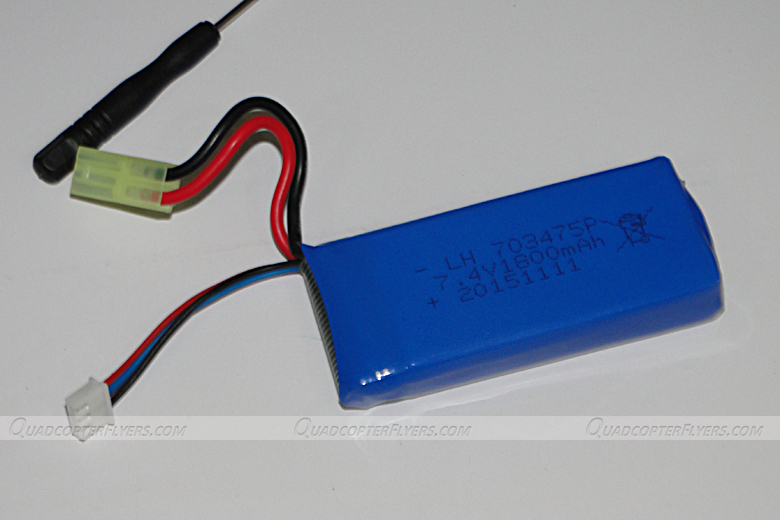 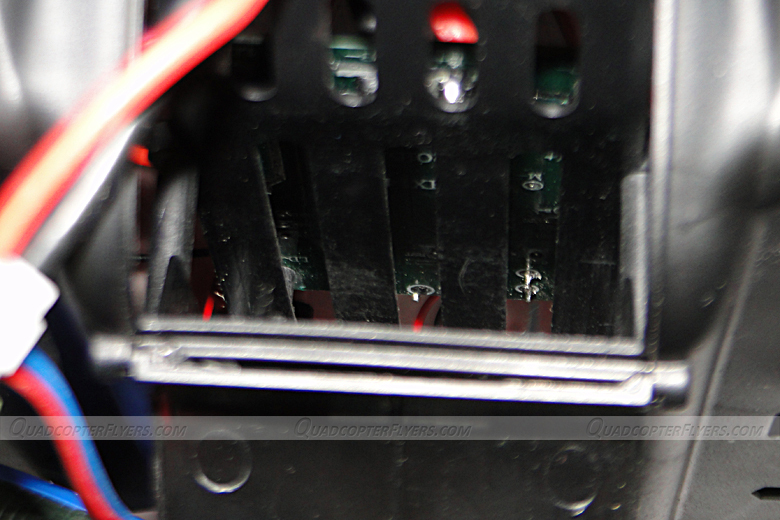 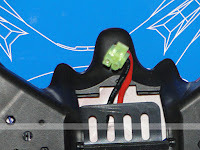 You will find a power switch (on/Off button) and a big battery compartment, it has got good room inside the compartment for big batteries beyond what is shipped along with the quad. 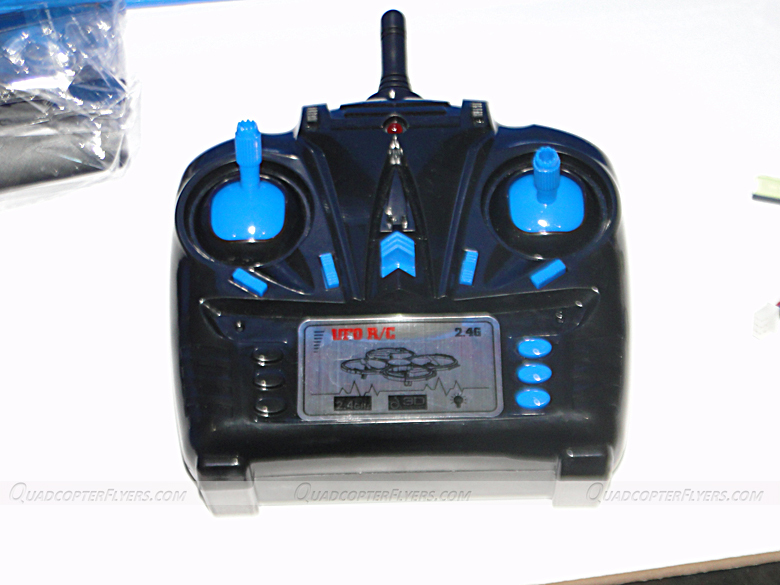 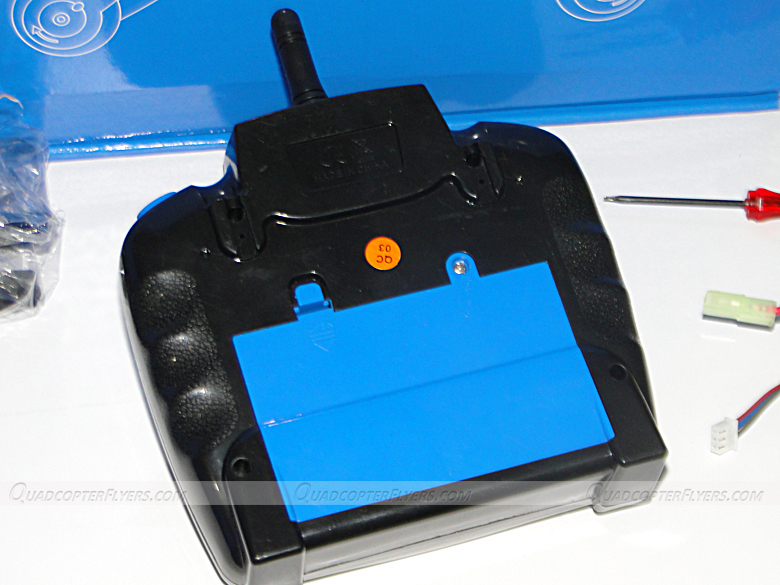 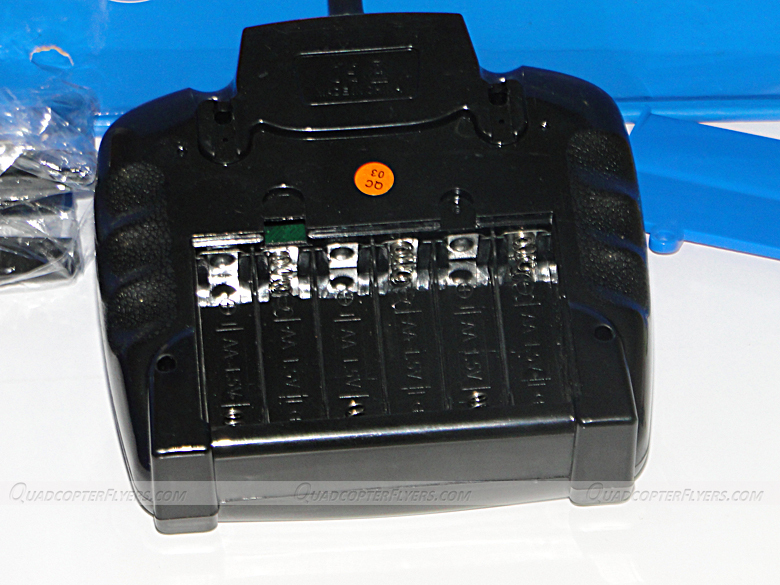 The transmitter comes with a traditional design with black body and blue control buttons and the transmitter operates with 6 AA batteries. 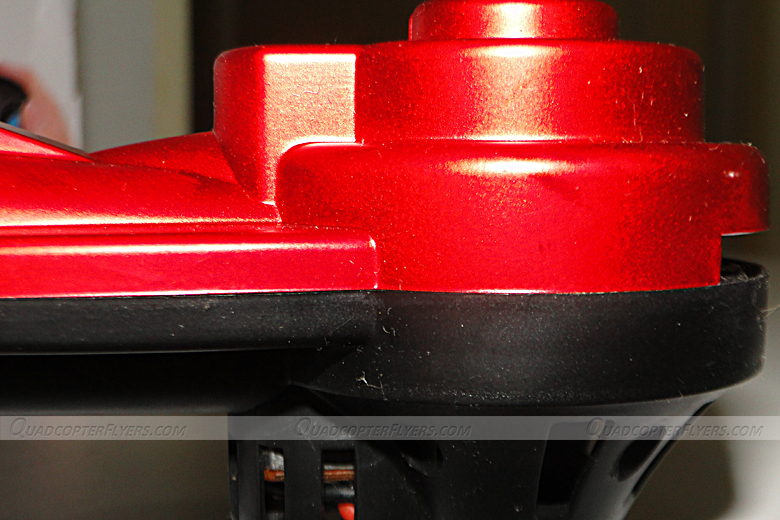 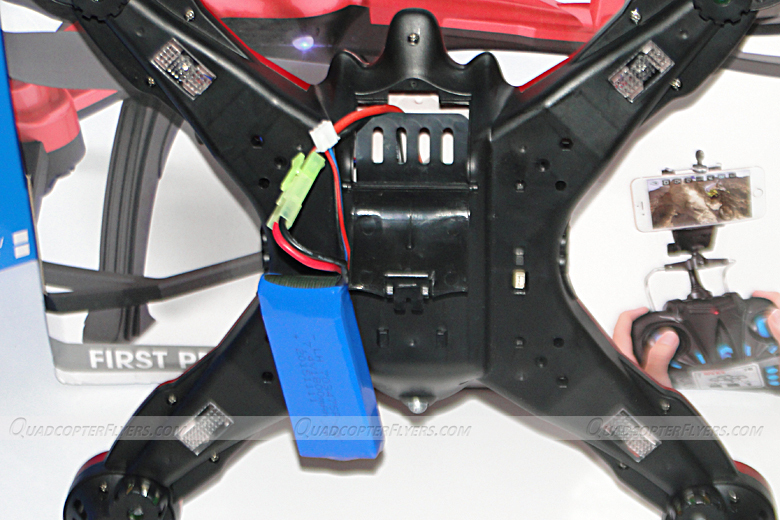 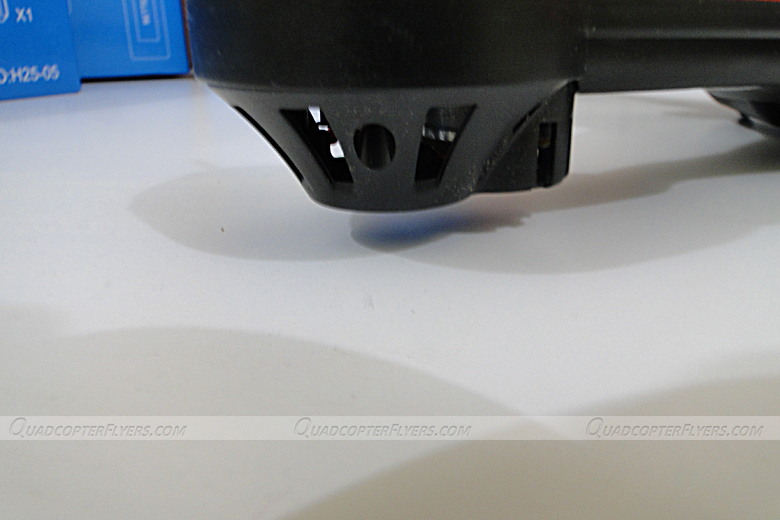 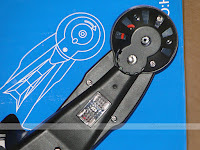 As seen on most of the RTF Quadcopters, JJRC H25 comes with on/off switch placed in the middle of the throttle and aileron sticks. Unlike in Syma Transmitter, the bottom porting has NO digital LCD to indicate the status. 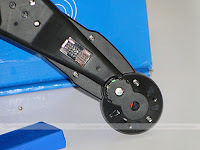 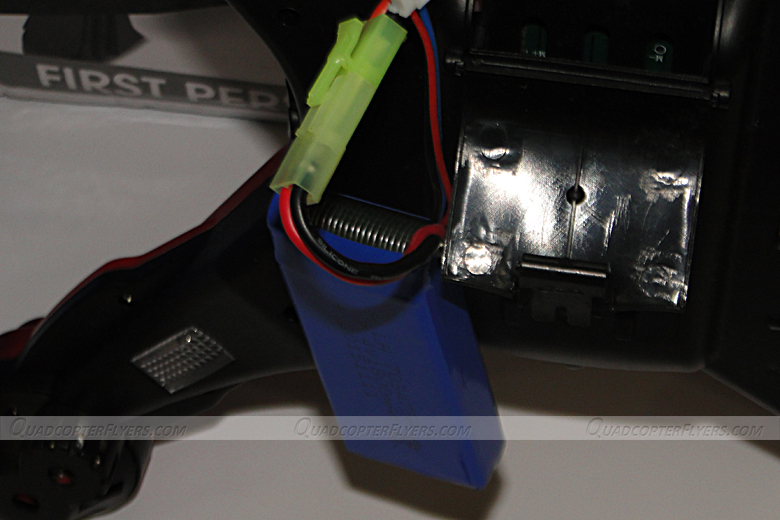 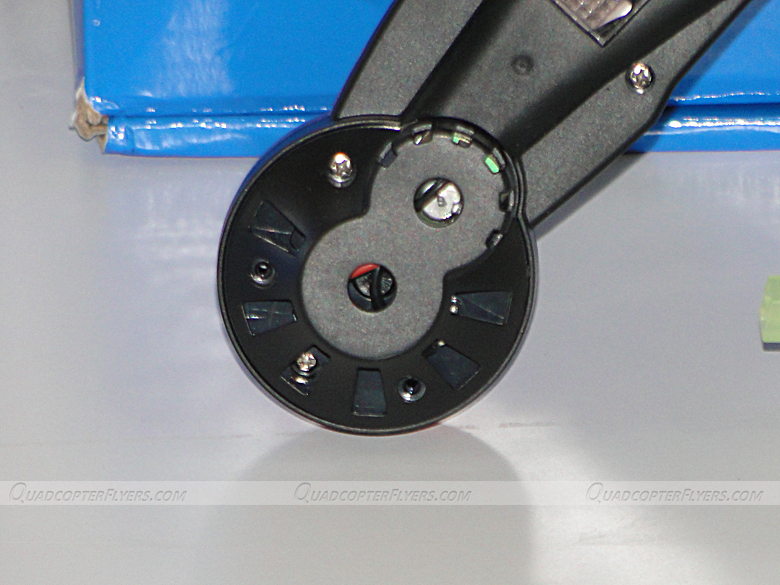 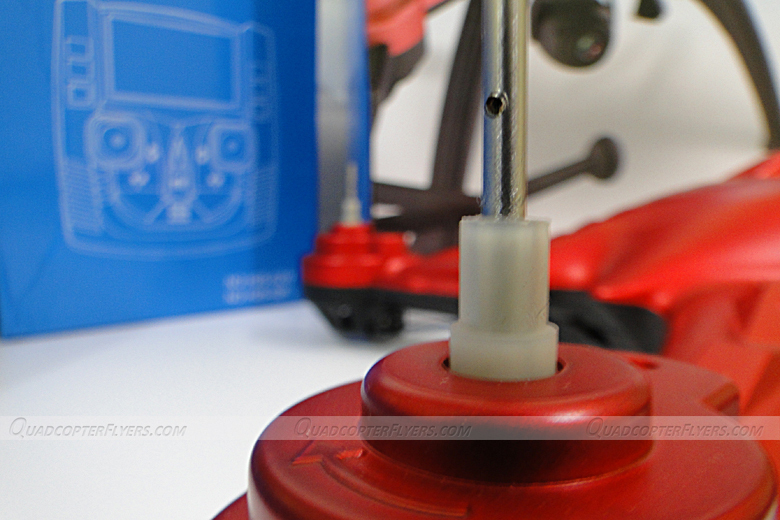 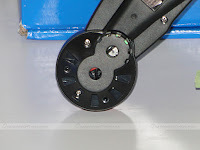 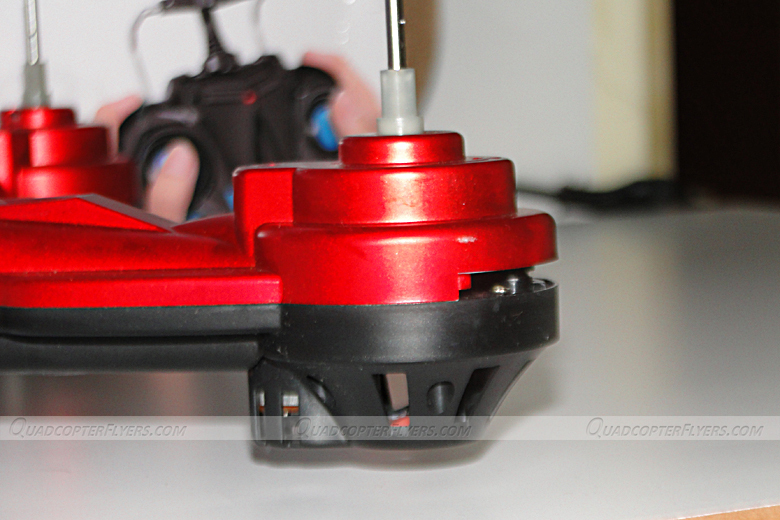 The binding works the same way as it works for other JJRC quads, once the transmitter recognizes the the quad, you will hear a beep, now a simple throttle up and down will bind the quad and makes it ready to fly. 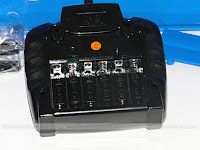 The top right shoulder button is for flips, the top two right buttons are for headless mode and one key return respectively. Indeed the 1800 mah battery is something that i was more focused on , a definite 12-14 minutes flight time with the standard version, no camera and FPV, but some flips during the flight. 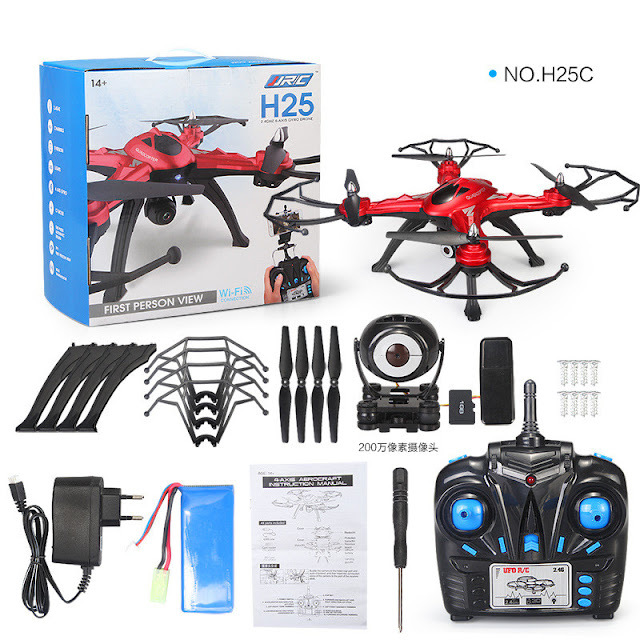 JJRC H25 flew to my expectations . 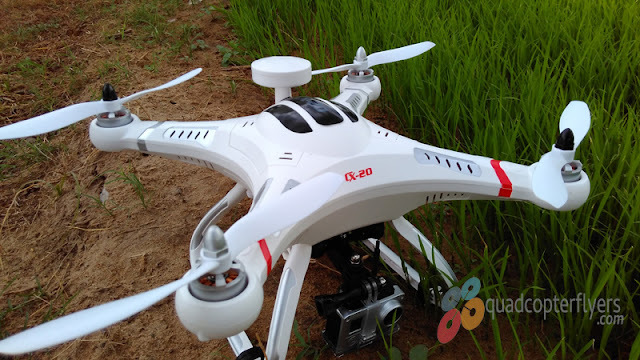 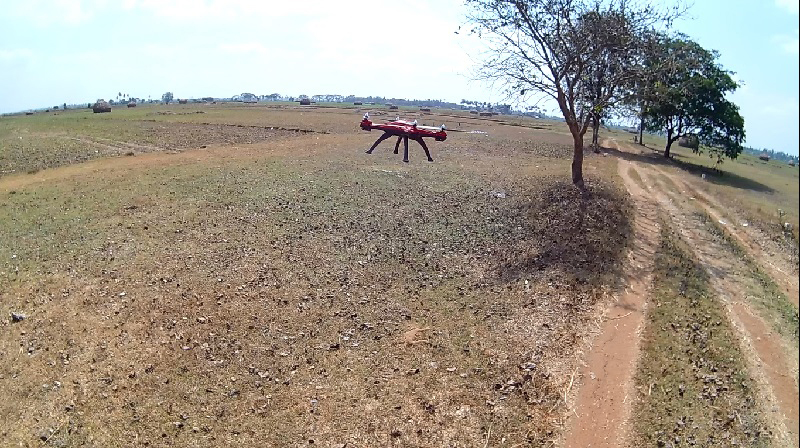 the In air, its very responsive and highly stable and admitting the fact that, the quad drifted to left in mild wind conditions in low rates and was able to fight the wind when switched to high rates. JJRC H25P can operate in multiple rates, high, medium and low with a tap of a button on the transmitter, just beside the throttle stick. 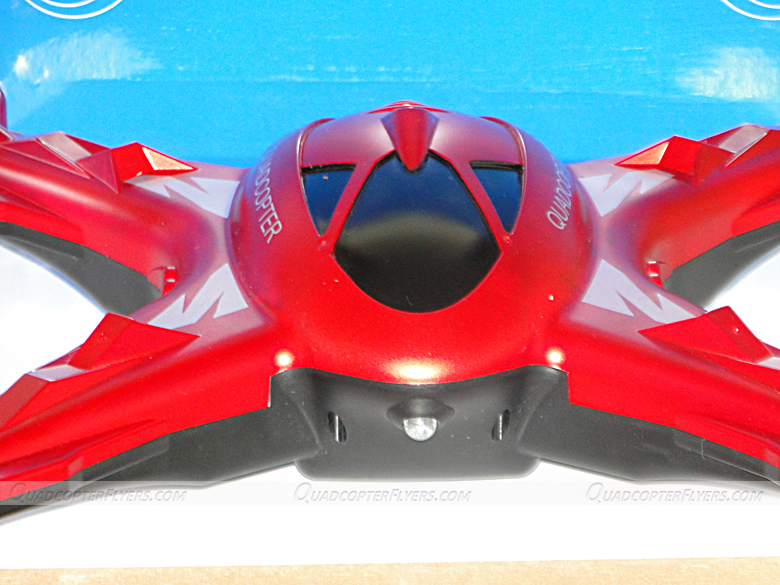 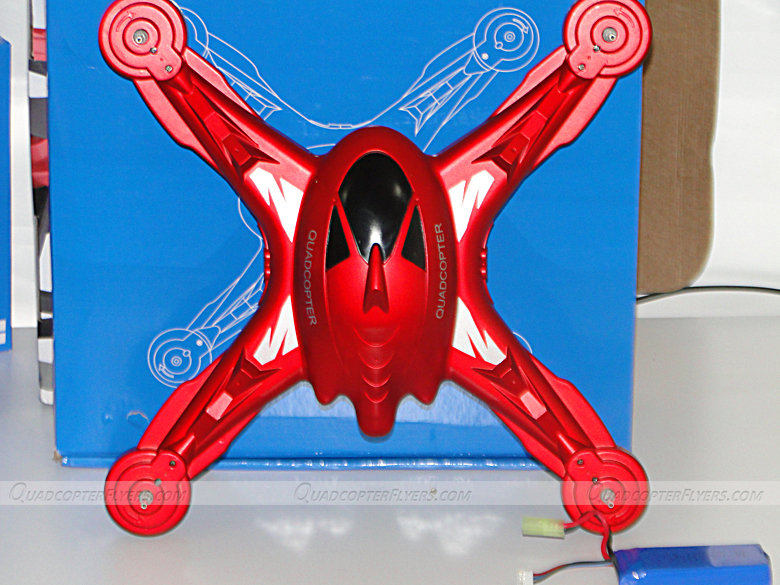 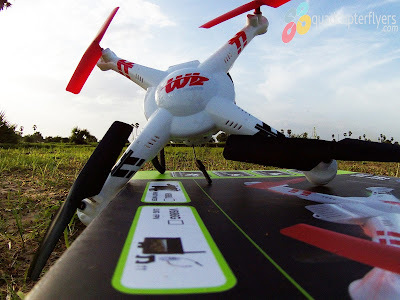 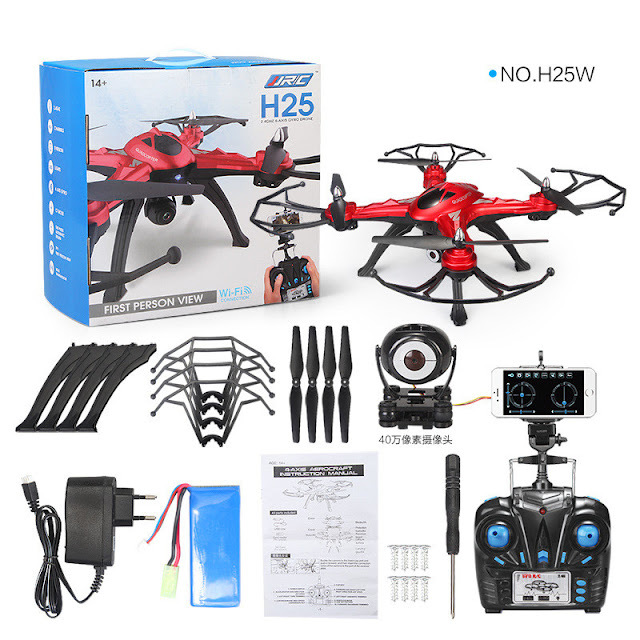 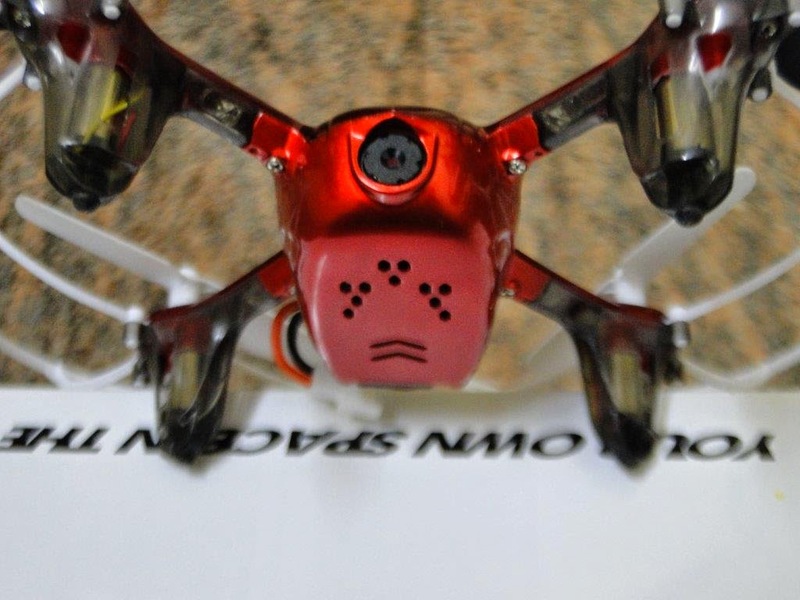 The headless mode and the return to home works as advertised, but i see a lag when the quad is returning back to one, the return to home is quite slow and you need to take control of the quad on windy conditions. 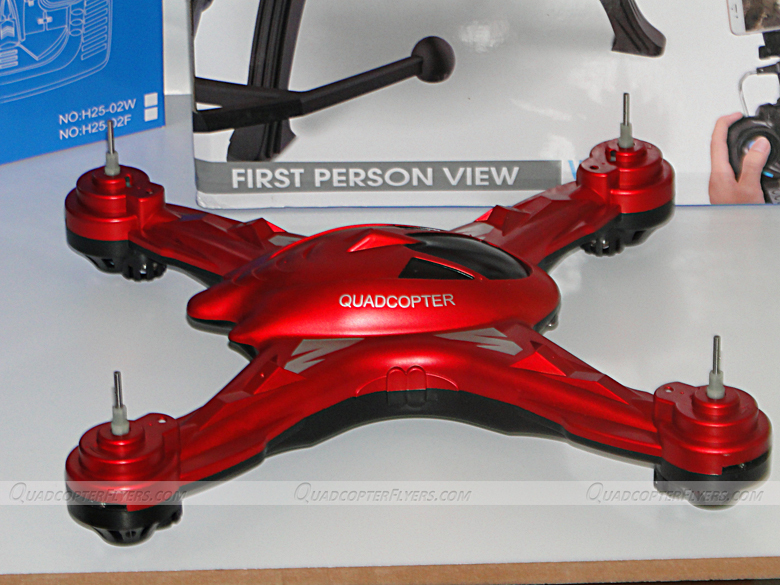 Worth to mention again, yes definitely a 12-14 minutes of flight time with 1800 mah battery , a single charge will take almost 90-120 minutes for a full cycle, sufficient enough for a casual flying. 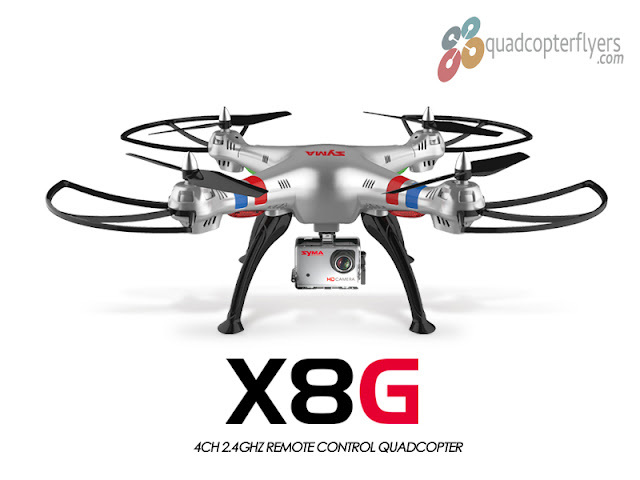 The yaw rate is not as fast as the X8C but the big quads are all not designed to have great yaw. 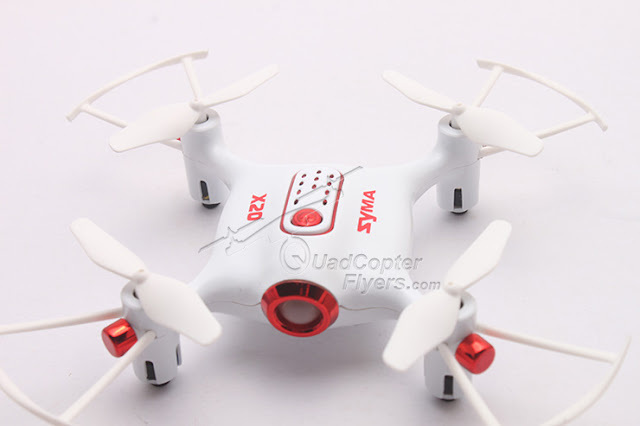 When compared to its closest competitors, SYMA X8C, JJRC H25 flies well, definitely in on-windy conditions and its an absolute better choice for beginners and experienced casual flyers with longer flight times, a big flying experience. 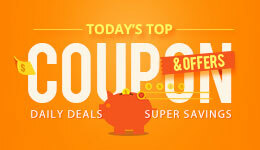 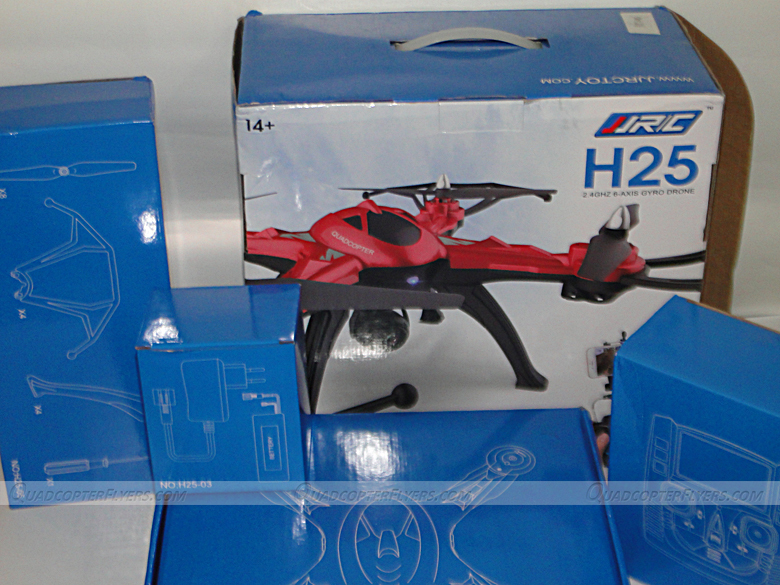 JJRC H25 is available for Purchase and ships in 24 hours, Click Here to buy now from Tmart.